Experience Lake Michigan Charter Boat Fishing with Lie-A-Lot Charters of Ludington! 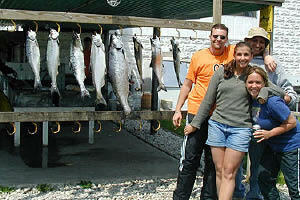 Ludington is the number one port for Salmon and Trout fishing on Lake Michigan. According to the DNR fishing reports, more fish are caught in Ludington per angler hour than anywhere else in the state. Charter boat fishing is big business in Ludington and Lie-A-Lot Charters offers the finest charter boat fishing experience on Lake Michigan! Captain Mike Darke operates this full time, full service charter boat operation. His goal is to provide everyone with a quality fishing experience that you will remember for a life time. Whether you’re a first time fisher person or an experienced angler, Captain Mike will customize your fishing trip around your needs. With over 20 years of experience fishing from Ludington, Captain Mike will use his knowledge to insure a safe relaxing and exciting experience. There's something for everyone when you go charter boat fishing with Captain Mike. The excursion will be the highlight of your vacation. It’s all about having a fun fish catching trip that's an adventure for all. When you're not reeling in the fish you'll notice that the scenery from the open waters of Lake Michigan is truly spectacular! Sand dunes line the shore from Little Sable Point, by Silver Lake Sand Dunes, to Pentwater, to Big Sable Point at Ludington State Park and on past Manistee. The area is accurately named Ludington’s "GOLD COAST" and is truly a sight to see from the waters of Lake Michigan. Depending on where you fish, you will have a photo opportunity at one or more of five historical lighthouses. Additionally, Lake Michigan is also world renowned for its breathtaking sunsets and sunrises. While you are out to sea on Lake Michigan, you may encounter many vessels. They range from the world famous car ferry - the S.S. Badger - to big freighters, tugboats, tall three-masted schooners, and even mega yachts. There may even be an old pirate ship in the mix! Captain Mike’s day starts early, long before your arrival. He will check the weather and water temp charts, and then decide on a program for the day. He will place all the baits on all the poles, check all the lines for nicks, and decide on what techniques will be the most productive for the best fishing! Upon your arrival at the dock, Captain Mike will cheerfully welcome you be aboard the Lie-A-Lot charter boat and help you store your gear. As the engines are fired up and the electronics turned on, the anticipation builds. The boat heads out of the Ludington Municipal Marina to join the rest of the fishing fleet in the main channel. You will pass by the U.S. Coast Guard Station and the Ludington North Breakwater Light, then out to the open water of Lake Michigan. The Captain sets the autopilot for your fishing destination, the engines roar to life and, in just a few minutes, you will be at the fishing grounds. Upon arrival at your fishing destination the flood lights are turned on. The Captain will work feverishly to set all the rods before the morning bites. Now is a good time for coffee and doughnuts. As a glimmer of daylight shows in the eastern sky, you have your first bite. "FISH ON!" The first battle of "man vs. fish" of the day has begun! Then another bite, and another. With three fish on and more on the way, the action is heating up! As the sun rises higher in the sky, the morning routine slows to a more manageable pace. The Captain points the boat toward deeper water and changes the program for mid-day fishing. Now it’s time to relax. Maybe even a short nap until it’s your turn again. The food and drinks are brought out. The stories and jokes are being told. There’s laughter all around. The Captain may have one or two of his own stories to tell. After a few more hours at sea, your Lie-A-Lot charter boat fishing adventure will draw to a close. On the ride in you will have time to reflect on what a truly a magnificent fishing adventure this was. Upon arrival at the Ludington Municipal Marina, you are invited to watch as your fish are cleaned and packaged or just relax in a clean park-like atmosphere. When finished, the Captain will wish you a safe trip home and invite you to come again. Evening fishing trips are similar except you will leave in the daylight and return at dark. The action on the evening trip is just the reverse. The action starts off slow and heats up toward sunset. 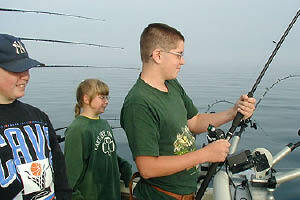 Charter boat fishing on Lake Michigan can truly be the highlight of your Ludington vacation. Call Captain Mike Darke today and make your reservation for the fishing trip of a lifetime!